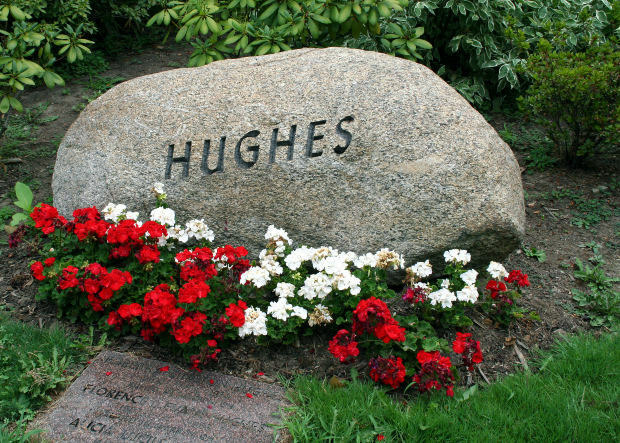 Gravestone and adornment for Hughes (no relation). Maggie Donkins, 82, Bass Lake — as described above — came to the end of earthly life on Tuesday at her parents’ home in rural Bass Lake. Her parents had not lived there since the ‘80s, when they passed away — but Maggie and her late-husband did live there, since that time, prior to their deaths. Maggie was born Margaret Prescott on March 14, 1932, in Esmeralda, Michiana. When the town folded due to a seismic demographic shift, the family moved into a farmhouse near Bass Lake. That’s the house referenced in the prior paragraph. She graduated from Bass Lake Schools in the early 1950s. On July 5, 1952, she married James Donkins at Bass Lake Post-Episcopal Church, sworn into betrothal by the Rev. James S. James. James died April 1, 2009. The minister preceded James in death on July 6, 1952. That minister was married Aug. 5, 1928, in a private ceremony in Ohio, presided over by pastor James Donkins (no immediate relation). He died in 1971 at the age of 95. Visitation, funeral, burial and memorial contributions will be announced at a later date — possibly by the end of tomorrow. Survivors and other details will be elaborated upon after that point.